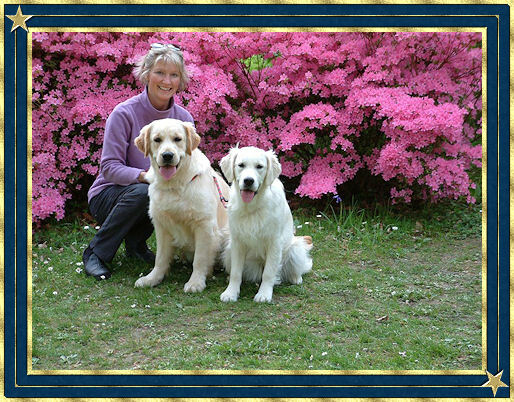 For the last twenty six years it has been my passion and my mission to produce typical golden retrievers with intelligent characters who have a natural ‘will to please’. Almost all my breeding stock over those years have gained their Show Gundog Working Certificates. Which means they have had to prove they can work alongside other dogs of different breeds, off lead on a shooting field, to find and retrieve game birds, gently to hand. They absolutely come alive when undertaking these tasks and I think it tells something about their characters! All my dogs sleep in the house and are my constant companions during the day. My puppies are well socialised before leaving for their new homes, even if we do live in the countryside. You will also see when looking through my site, that we have definitely had considerable success over the years in the show ring, both with my own dogs in the UK and with many other kennels throughout the world, making very good friends along the way. As well as the above, I have many, very happy owners of my puppies which are much loved family pets, quite a few owners have come back to me two and three times for another puppy. It is always a great reward to see how the puppies develop into beautiful, well balanced adults. Thank you for visiting the Trewater website, I hope you enjoy your visit. Please send any questions or comments regarding my website or my dogs by clicking on the logo at the top of each page, or use the e-mail form on the Contact Page.